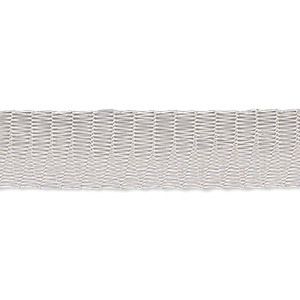 Mesh ribbon, enameled brass, silver, 12mm tubular, fits up to 18mm bead. Sold per 1-meter pkg. Item Number: H20-6465BS Have a question about this item? 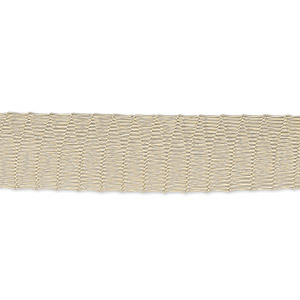 This mesh ribbon is a perfect blend of delicate and strong, which gives you a myriad of design options. 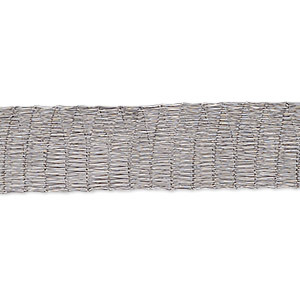 The tube shape allows the mesh to be filled or wrapped with beads, ruffled, twisted, tied, stretched or even used as a stringing material. Made in Italy, this high-quality mesh is enameled brass, coated with lacquer to prevent cracking, flaking or color change over time. Mesh ribbon, enameled brass, black, 12mm tubular, fits up to 18mm bead. Sold per 1-meter pkg. Mesh ribbon, enameled brass, gold, 12mm tubular, fits up to 18mm bead. Sold per 1-meter pkg. 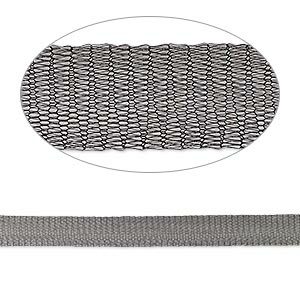 Mesh ribbon, enameled brass, titanium, 1/2 inch tubular mesh, fits up to 18mm bead. Sold per pkg of 1 meter.